Enter into DWELL: Living an Art Life presented by Sugar Press and hosted by Spring Arts Collective at Spring Arts Tower, 453 S. Spring Street, Los Angeles, CA 90013 on the Mezzanine of the Last Bookstore. 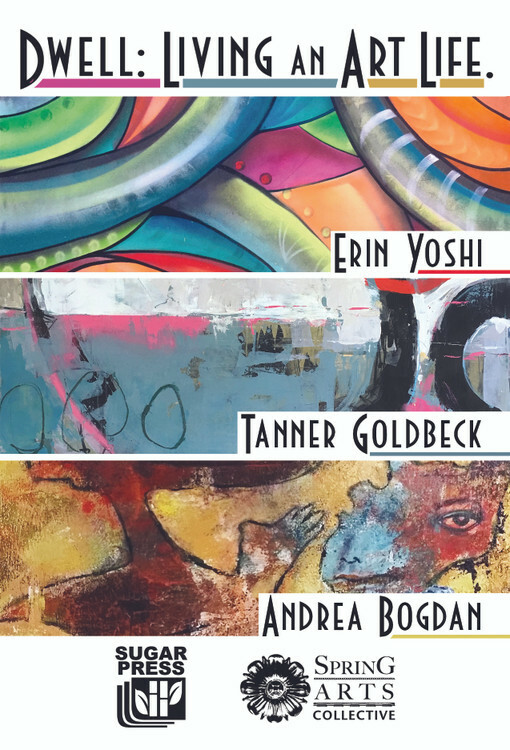 Artists Erin Yoshi, Tanner Goldbeck and Andrea Bogdan engage the viewer with an intimate experience into each artists mind and living space with paintings, painted furniture and prints, curated by Anne Martin of Sugar Press. This exhibition will open Friday, January 18, 2019 and run through Saturday, March 16, 2019. Original artworks and prints will be available online at Sugar Press and in person at Spring Arts Tower Gallery, their hours are Sunday-Thursday 10am - 10pm, Friday-Saturday 10am - 11pm. The artist reception is Friday, January 18, 2019, 7-9pm. Curator Anne Martin, from Sugar Press, brought together Erin Yoshi, Tanner Goldbeck and Andrea Bogdan for DWELL: Living an Art Life for viewers to get a peek at the complex interworking of each artist as they spill out onto furniture as well as canvas, and are captured in fine art prints. Erin Yoshi’s deeply engrained attention to global changes allows her hopefulness to flow outward, with charged color, icons in nature and a thick flowing movement. Tanner Goldbeck engages with the awkward and uncomfortable and flows it into luscious forms that feel semi familiar, balanced between comfort and the lack of it. Andrea Bogdan’s work is conjured from the unseen, coaxed up and up, into existence, into form and figure, feeling as if it comes up and out from the dreamtime. DWELL: Living an Art Life is hosted by Sugar Press, the leader in contemporary, ecologically sustainable, archival art prints. Creating the highest quality fine art prints on state-of-the-art, recycled or sustainable paper. Sugar Press works one-on-one with artists to ensure their vision is translated onto paper with the highest technical and archival standards. This exhibition, is an example of their personal, unique and often philanthropic partnerships. The exhibition is hosted by The Spring Arts Collective Gallery, located on the Mezzanine of The Last Bookstore. The Spring Arts Collective is a group of five artists who work in the Spring Arts Tower and run the Spring Arts Collective Gallery. DWELL: Living an Art Life opens Friday, January 18, 2019 at Spring Arts Tower, 453 S. Spring Street, Los Angeles, CA 90013 on the Mezzanine of The Last Bookstore, and run through Saturday, March 16, 2019.